I am Dutch, quilter since 1993 and since that year I made a lot of quilts, bags, charity quilts and other things. Most things I know I learned with the help of books. I took a few courses: quilting by machine, baltimore album, sewing round forms and the tree (machine embroidery) by Mary Hackett. 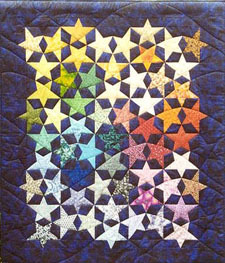 "(Cosmosdust is) a very pretty, blue quilt with fivepointed stars. It took me an afternoon to find out how the block has been made and to draw it. I have used all colors of the rainbow." Lies provides two patterns for us for this quilt: one is the block pattern itself and the other is the piecing pattern for the quilt. Download them both below! Also be sure to check out Lies's website where you will find many more wonderful free projects!